For all the growth of three-dimensional mapping techniques, the surfaces are often (quite literally) dull. In Prismatica, an installation piece, the material is part of what makes the work so beautiful. Color and geometric form drip through the crystals like liquid, in a work that revolves like a modern, digital mandala, a kaleidoscopic meditation. 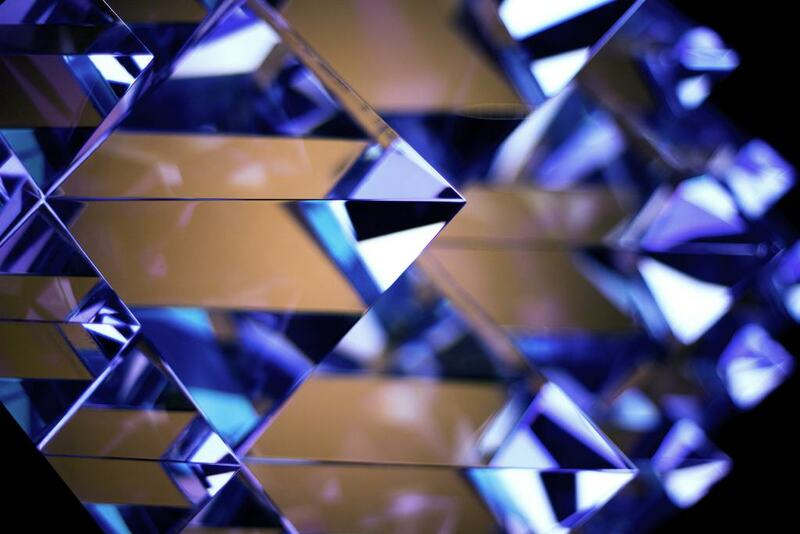 Prismatica consists of an arrangement of pyramid-shaped crystals affixed to an LCD screen and illuminated with programmed geometric animation. The animated patterns are precisely mapped to the vertices of the crystals, illuminating them individually and in formation. The animations are further refracted through the geometry of the crystals in accordance with the shifting perspective of the observer, which in turn alters the way the illuminations appear and interact with reflections of surrounding lights within the space. This piece acts as an extension of the visual and perceptual experimentations of my immersive installations.